Our meetings are held at the Elks Lodge here in Apache Junction on Hwy 88 on the second Tuesday on each month at 7 p.m. See the events calendar for meetings. 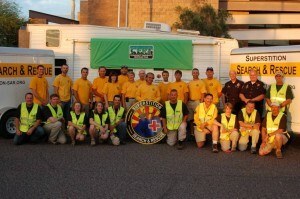 Joining Superstition Search and Rescue can be very rewarding, but it also requires a large commitment. In addition to requiring ownership of various technical gear, group membership also requires significant time – you may be called on a rescue that may last days. We realize that not all members can just take time off whenever there is a callout, but many members will work extra shifts to make up time at work or even use vacation days for searches. You will need to coordinate with your employer about your involvement with the rescue group. Your family also plays a role in your membership. Rescues and training take you away from your family for hours or even days at a time. Your loved ones may not understand your commitment to the group and they might sometimes have to take a back seat to the needs of lost or injured individuals. Make sure your family fully understands the role and responsibilities of Superstition Search and Rescue before you decide to join. On the positive side, there is nothing better than the feeling you get after finding lost or injured individuals and returning them to safety. The heartfelt thank-you’s received from subjects and their families add to a truly wonderful and rewarding experience. If you are ready to make the commitment, then your fist step is to come to a general meeting. At the monthly meetings you will learn more about the organization, get to know team members, listen to stories or recaps of the latest missions and get additional information about membership requirements. Membership dues for all volunteers (Rescue, Base Camp & Resource Teams) are $40 annually, and an application and background check are required. New members will undergo a 1-year probationary period while they obtain preliminary training, and acquire appropriate gear. While this is a volunteer organization, attendance and participation in training events and searches are very important. So, if you are interested, have support from your family and a willingness to learn new things, feel free to attend a meeting and meet the group. See our calendar for meeting times and locations. We hope to see you there!